« What is atmospheric perspective? Continuing with the atmospheric perspective theme, this post takes a quick visual tour of 5 different factors that affect the strength of aerial perspective. 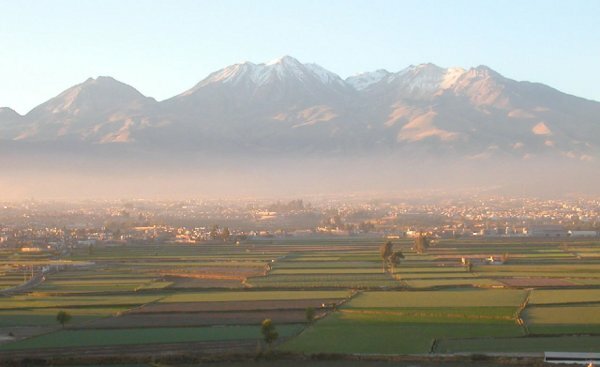 Smoggy industrial cities have more dust, soot and other sun-scattering particles in the air causing stronger atmospheric perspective effects compared to smog-free locations. With air pollution, the aerial perspective effect tends to be strongest near the ground, like a yellowish ground fog that rises up to several hundred meters from the Earth’s surface. Atmospheric perspective is at its most spectacular at dawn or dusk. When the sun is low in the sky, sunlight produces an array of rich and varied colors in the atmosphere – reds, oranges, yellows, and purples. Distant objects take on these colors making the view more interesting than at other times of the day. Other lighting effects may come into play, like light rays or Jacob’s ladders. Humidity, fog and mist all magnify the aerial perspective effect due to water particles suspended in the air that scatter light. 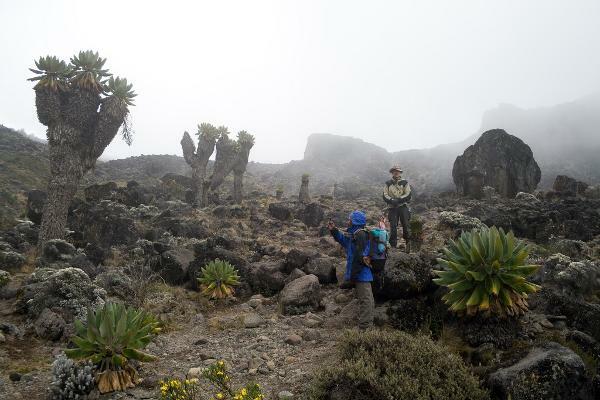 Typical examples are humid, steamy jungles and cold misty mountains. The mist in the photo above gives it depth and a sense of mystery. Storms and rain reduce visibility but their effect on atmospheric perspective may be less uniform and more random than in calm weather. When viewing a large sweeping vista, visibility may vary throughout the scene. 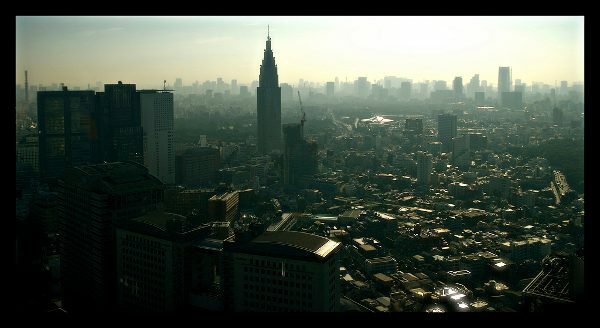 For example, some regions in the image may experience heavy rain and a strong aerial perspective effect while others could be in full sunlight. 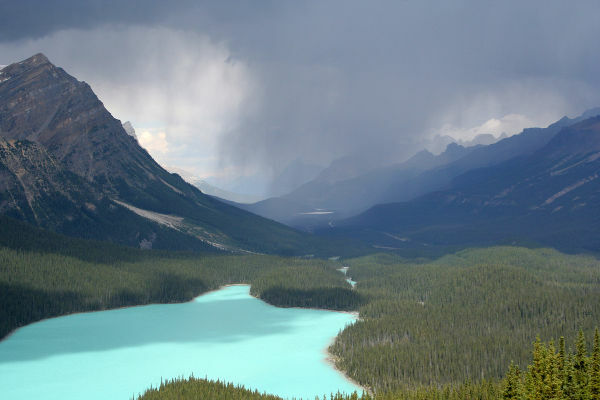 The photo above of a storm over Lake Peyto, Canada shows how the aerial perspective effect on the mountain at right is strengthened by a descending curtain of rain. 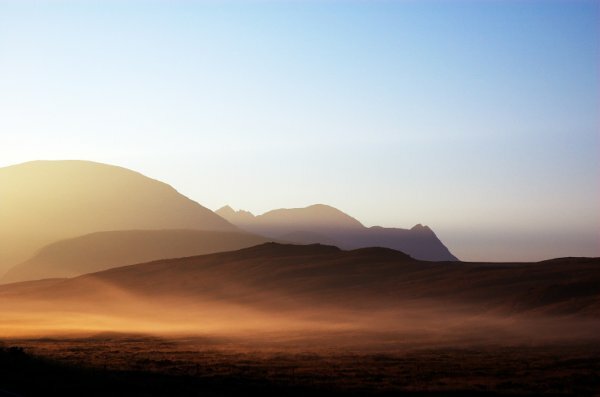 Regions where there’s a lot of dust or sand on the ground can get strong aerial perspective during and after strong winds pick up the particles into the air. 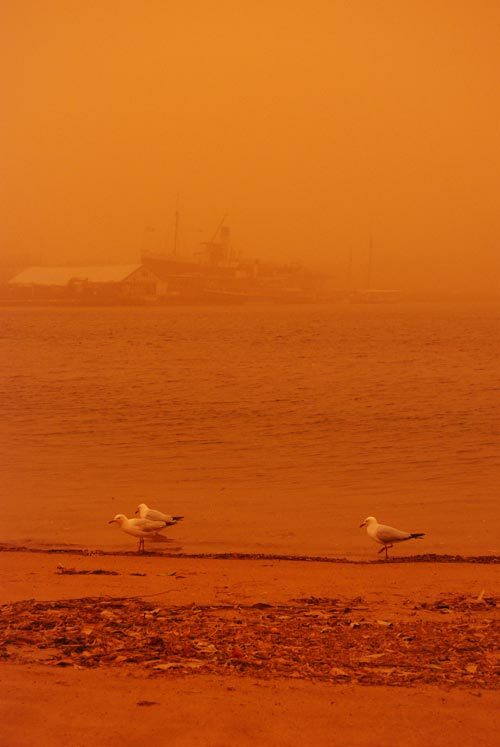 Distant objects would be tinted with the dust color as can be seen in the above photo taken after the 2009 dust storm in Sydney, Australia. The haze is tinted red due to the red sand that characterizes Australia’s deserts.